Cynthia turns 65 today! For her birthday, I had originally planned to put together a book of some kind for her, but after becoming overwhelmed by both the number of stories and our situation in general, I instead started just reading them to her in quiet moments. Here are just a few of the many stories, thoughts, and tributes that you have shared with us (all used with permission from their authors). But the great teacher inspires. In the years that Cindy and I have worked together, I have realized that she is, to quote an early Bee Gees album (circa 1840s), something “rare, precious, and beautiful.” When I had the opportunity to sit in on her grammar classes, I was dumbfounded by the enthusiasm she could bring to squiggles such as commas. Her true delight, however, was in her students, and she told me that being with them was the one thing she would miss as her role at school expanded. There are few teachers who are equally capable of being great teachers and fine administrators. What made Cindy so effective is that she brought the drive that served her so well in the classroom to her new office. Even as she worked to define her responsibilities with the faculty and with representing the school, Cindy remained the encourager and the teacher for her colleagues. I am more of a teacher now than I was before I met Cindy, and for that I am always grateful. 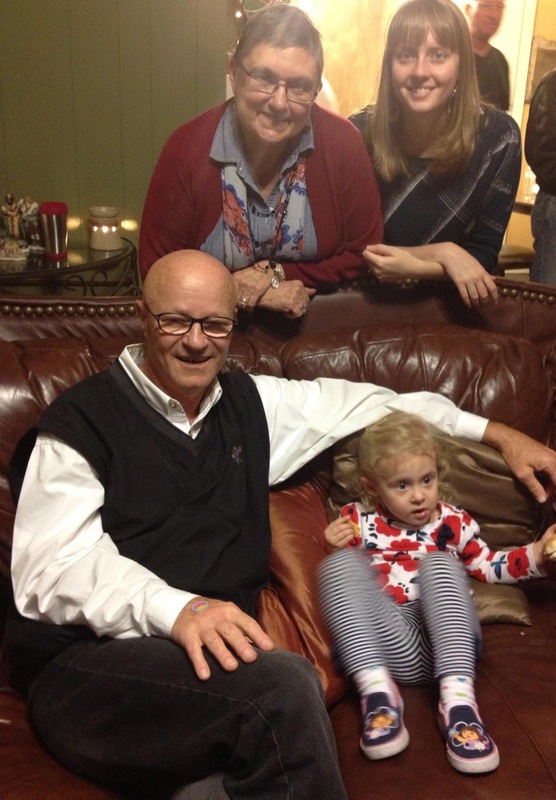 No one has impacted Mason’s life any more powerfully than Cindy Tripp. As a squirrelly middle schooler with more than the usual dose of angst, energy and emotional over reaction, Cindy believed in him. Always patient and kind, always encouraging and supportive, always with the dependable boundaries that he needed for security. When I was at the end of my rope with this difficult child of mine, Cindy was always confident of his true self and helped me keep the faith, knowing God had him right where he wanted him. A few weeks before I graduated, she asked me what I was most looking forward to about life after BA. Like a brat, I responded, “Being able to do whatever I want.” She let out a deep laugh–the kind that makes you rock your head back to let it out–and told me, “Chris, we always let you get away with what you wanted.” I was a bit taken aback at the time, but now laugh whenever I think about it. Your mother is amazing woman, and I am truly grateful that she was my teacher. Few people are as kind as her. You are such an inspiration to me. The bracelet you gave me gives me daily strength. Yes, there are knots in the bracelet to signify that life is sometimes hard. God never promised a life free of struggles. But the bracelet also has a cross to signify that He is always there with us…no matter what happens. And then the pearl reminds me that I am special. The bracelet* means so much to me because of what it signifies, and because it is from you. I will always cherish it as a tangible reminder of our friendship and how much it will always mean to me. When I think of who you are, the words that most come to mind are intelligent, thoughtful, caring, constant, persevering, and professional. I have always admired those qualities in you, and you have certainly set the bar high. I look to you to know who to be professionally. You have shown me how to be analytical and thoughtful, to examine every side of a difficult situation, never judgmental, always supportive of others experiencing crisis. The objectivity you demonstrate when dealing with emotional issues with the fine arts world (and let’s face it, we are never short of those!) is something I strive to emulate. You are always calm, cool, and professional. My daughter Caroline was torn about where to go to college. We looked all up and down the East Coast and at Miami of Ohio before Courtney Jones suggested that we visit Virginia Tech. We knew nothing about Tech but remembered that Sarah James had gone to school there so we went to talk to Cindy. Never have I seen her face light up like it did when she talked about Blacksburg! She even offered to drive up there with me to visit Caroline because, at that point, Sarah James had graduated and Cindy had no logical reason to make that six hour drive. She even went so far as to meet me at Starbucks and draw a map of all the “safe” truck-stops where Caroline could stop and fill up when she was driving alone. She also gave me a step by step of where to eat when we were in Blacksburg (including Macado’s and the Homeplace), how the Hokie passport worked, what dining plan to get, where she should live (The Well), what to wear to football games (Orange and Maroon Effect t-shirts), and all other things Virginia Tech. So Caroline made her choice and off we went to the most amazing university in the country! To say it was the best four years of her life to date would be an understatement. We all lived and breathed maroon and orange and when she graduated we all cried like babies because now we were in Cindy’s shoes. We no longer had a logical reason to make that six hour drive! What an incredibly brilliant, passionate and caring person you have in your mom. We hold her and your family in our hearts, and would gladly load up right now with her and make that crazy six hour drive. GO HOKIES! Honestly, I read it for the articles. We were in a mediocre hotel restaurant in Wilmington, DE shooting the breeze. I’m a former English teacher and occasional writer, so at some point Cindy suggested that I start reading Garden and Gun. I nodded politely. No, I thought, must be a Brentwood thing. I have neither a garden nor a gun. So, sure enough, based on her recommendation, I’m a current subscriber to Garden and Gun and she’s right! It’s my most anticipated magazine each month. I’ve bought music and scheduled vacations all based on a magazine that, as Cindy promised, is not so much about gardens or guns. So, thanks, Cindy, for convincing me to read it for the articles. You have great taste in writing indeed! It was such a special day when Emily and Mrs. Tripp made a breakfast feast of bacon, baked eggs in avocado and pancakes. The day was made supremely special by Mrs. Tripp, who generously gifted me with a bracelet* off her own wrist. 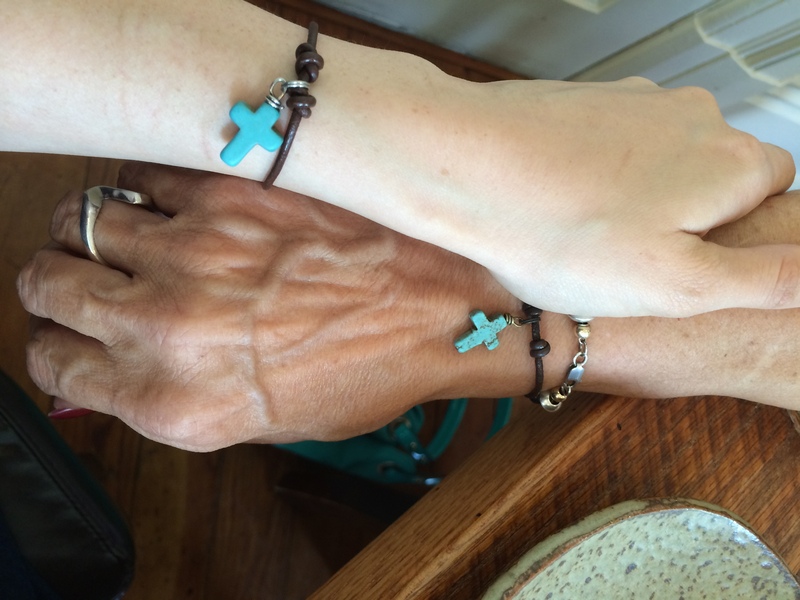 She and I were washing dishes and cleaning the kitchen when I had complimented her turquoise cross bracelets. When she told me the beautiful story of their origin I think she could tell I loved the story so much and what the bracelet represented that in that very moment she undid one of the bracelets from her own wrist and put it on mine. I wear it often. It makes me feel strong. Every time I get a compliment on the bracelet I am so excited to tell them the story behind it, that the cross represents life and the knots represent our struggle and that the pearl represents the beauty that we are. I have butchered how poetically it was said to me that morning, but is still one of my favorite little life moments. My MOST endearing story (there are many) of Mrs Tripp is when she greeted my incoming 7th grader on the 1st day of school with a decked out wheelchair and said “hop in Carly this is going to be fun! We’ll get all the boys to open doors and carry your books and all the girls are going to want to push you around!” and off they went. Carly had been in a terrible ATV accident just 3 weeks prior to school starting and suffered a broken arm and broken back…we were both dreading her going back to school. 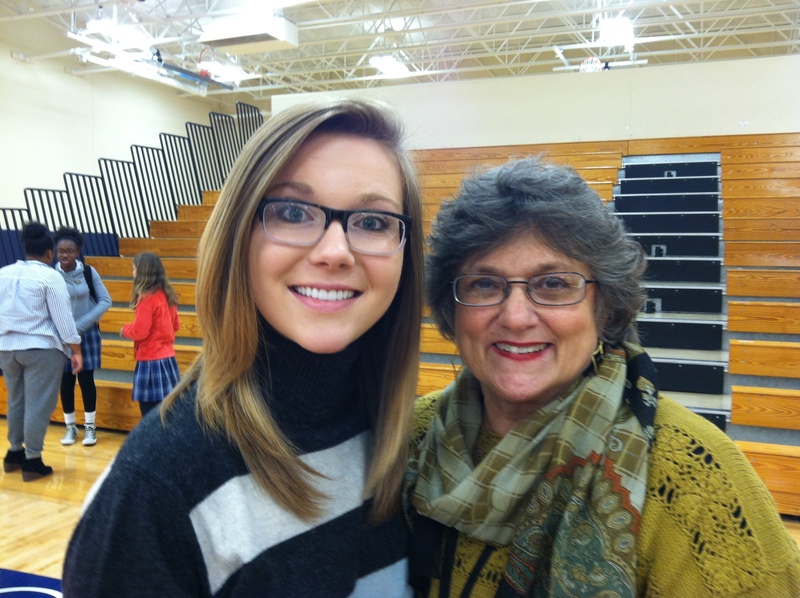 Not to worry–thanks to Mrs Tripp (and others at BA, of course) she never missed a beat. I held onto the pillow that CT had softened my daughter’s wheelchair with for years–I wish I still had it–a reminder of the happy, no-nonsense courage imparted to Carly Smallwood. The Brentwood Academy Faculty recorded a sweet birthday song for CT–we asked that they sing softly and slowly so that she could truly take it all in. She loved it–we paused the video several times to look at faces and talk about her love for all of you. *the bracelet is made by Pam Murray, and can be found at http://www.pearlandleatherrustica.net. It was first gifted to my mother by Shelley Wolf in the days following her initial diagnosis. It has been a great comfort to her friends and family to be connected to so many others walking this path. Teachers like our Miss Tripp are truly a jewel in our busy world ! Thank you Jesus for using Cindy in such a mighty way. Thank you for her sweet family! They truly are! She was my first teacher, and I still remember the joy of being in the classroom with her. I met you when Reed was coming into 7th grade and I was honored to be grade Mom. You were the most together teacher I had ever seen. The perfect nails. The stretchy keyring. The syllabus. The study guides. The organization. You seemed to know everything about everything! I was intimidated and amazed. And as the year unfolded, you became an encourager of our son. He was wide open and full speed ahead, but you got him. You saw him as a leader instead of a distraction. That was HUGE to us. And he respected you. I was never so grateful! And through high school and even college your continual encouragement of him made a difference. Last year when he (finally) finished at UT your kind words were, “I never doubted him”. He grinned at hearing your words, and we both knew in that moment the fulfillment of years of work and hope and success! You have the gift of encouragement. There must be SCORES of whole families you’ve encouraged along the way. I’m sure given the time I could list a couple of dozen myself! I could probably go on with story after story. My memories are many and meaningful. Our family is better because of you. You made a difference for us. And indeed we flourish in some ways because of you. We love you and are grateful God blessed our path with you along the way. I hope you got your favorite cake today! Or ice cream or pie or whatever your best birthday treat is 🙂 Enjoy it all and know you are much loved and prayed for. Joy, I love that story about discreet honesty; it makes me laugh. She’s been saying a lot since Christmas that she isn’t very nice–and in a way, I agree with her. She’s not nice, just to be nice, but she is kind, and honest. There are so many conversations we’ve had that I’ve come away from the same way–laughing, because she’s usually right, and she gets me to think about things in a different way than anyone else could. I’m so glad she has been special to you and your family! It has been enlightening to read all the notes from the people you taught, mentored, encouraged, advised. Because I never knew you professionally. To me, you have always been “just my dear friend”. But, oh, what that “just my dear friend” encompasses and what we have shared. Long talks over lunch, lazy afternoons at the movies (some good, some we walked out on). Shared books, shared hopes. Laughter and tears. Gossip, and deep political discussions. Our love of NYC and Broadway shows, our love of quiet Florida beaches. Snooping through antique stores. Oh, what fun we have had! And all of it always true, never a moment of pretense. No secrets between us. Cindy, from the day we met at the Habitat build, we connected. And now we are still connected, no matter the circumstances. You are in my heart every minute of the day. I love you, my dear, dear friend, always and ever. 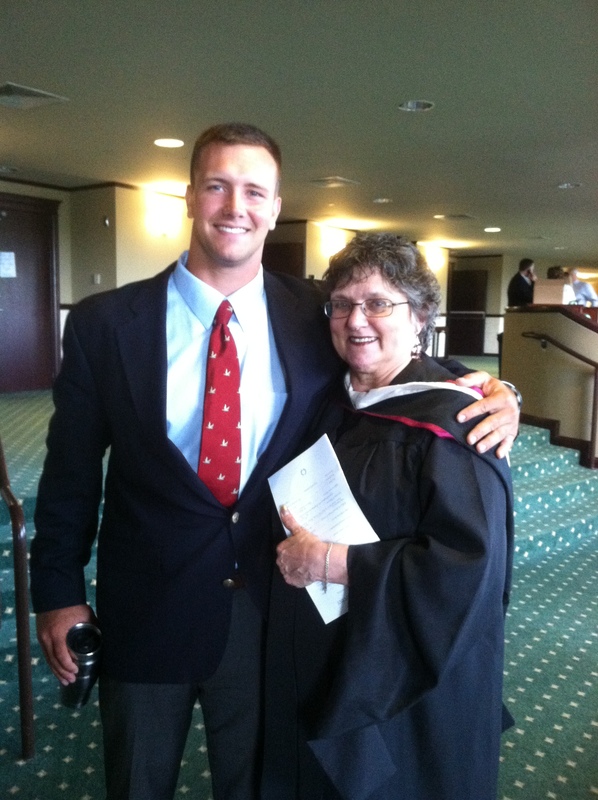 Pat, I’m not sure I can ever say enough to convey how much my mom (and the rest of the Tripps!) care for you. She’s said over and over that you’re an angel–you give so generously of yourself to her and to us, and we cannot say thank you enough. Life is ebb and flow, just as constant as the sea. The repetition of sound and the predictability of change is dependable and therefore soothing. When a storm is raging is not the time to insist on raising your umbrella and forcing your plans into motion. Stay inside and be dry. There is beauty in the wind and the storm as well as the sun and the sand. While we are all essentially alone, our connections to people we love and who love us makes our aloneness not lonely. There is something precious about a sweet child enjoying the waves and the beach and kite flying and making sand castles. Hi Kim, you can send it to emilylorrainetripp@gmail.com. Thanks! Happy Birthday to your beautiful, sweet Mama – we are grateful for the gift of her in the life of our family! Happy (very) belated to you, Candy! Thank you for being such a wonderful sister to my mom.